Port Askaig has for centuries been a gateway to Islay. Ships from West Loch Tarbert on Kintyre have called here since the 1700s and it was the destination of a steamer service from Glasgow as early as 1825. 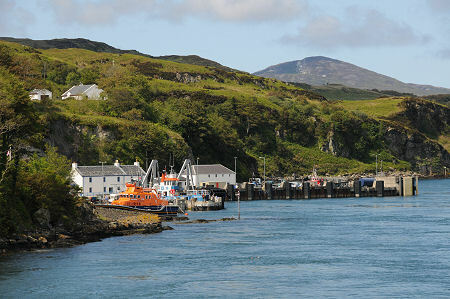 Today it is one of two ferry ports on Islay, the second being Port Ellen at the southern end of the island. Port Askaig also serves as the ferry port for the wild and lonely island of Jura, whose only road starts at the slipway at Feolin Ferry just across the half-mile wide Sound of Islay before heading round to the island's only village at Craighouse and then petering out two thirds of the way up the island's east coast. In many ways Port Askaig is defined by the comings and goings of its two ferries. It can be frantically busy when the main Islay ferry is expected or in port, and totally quiet at other times, with the Jura Ferry providing more frequent but much lower key injections of activity throughout the day. Visitors to Port Askaig from the mainland find themselves in a tiny settlement. On emerging from the ferry you sweep past a some white port buildings, a shop, the Port Askaig Hotel: and that's just about all you have time to see before you tackle the new road that climbs steeply out of the village. On the hillside just south of the village, and best seen from the arriving or departing ferry, is the imposing Dunlossit House. This fine Scots Baronial mansion was built in 1865 before being rebuilt in its current much grander form in the years between 1909 and 1911. In 1937, Dunlossit House was purchased by Baron Helmut Schroder, whose family had been members of the Prussian aristocracy. Today it is the home of his son, Baron Bruno Schroder. He still has an interest in the merchant bank and finance house that bears the family name, but spends part of his time on Islay. In 1997, the Baron and his sister contributed £675,000 towards the £1.4 million cost of a new lifeboat for Islay, named "Helmut Schroder of Dunlossit II" in memory of his late father. This is based in the lifeboat station at Port Askaig, which opened in 1934. As the name implies, the lifeboat's immediate predecessor had also been funded by the family. The lifeboat station is open to visitors, while the lifeboat itself is a striking splash of colour against an otherwise largely white painted village. Port Askaig itself has seen dramatic change in recent years. A photograph we took in April 2002 on this page shows the road climbing a wooded hillside immediately behind the village. The equivalent photograph at the foot of the page, taken in June 2011, shows that much of the wooded hillside behind the village has been scooped out of the native rock to provide large new areas for vehicles to queue for the ferries, and a new access road. 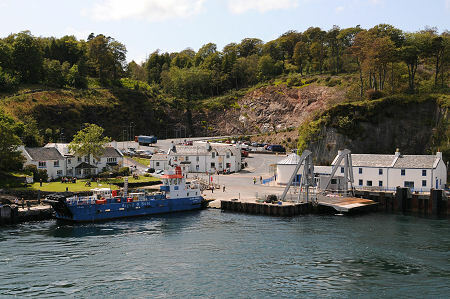 The redevelopment of Port Askaig took place between 2006 and 2009 and cost a total of £13.7m. As well as the obvious changes to the hillside at the rear of the village, the project involved the building of a new ferry terminal, the construction of a new linkspan for the main Islay ferry, and a new berth for the Jura ferry. Ironically, 2011 saw work underway to improve the main ferry berth further, following the arrival of a new ferry, the MV Finlaggan, on the route. Just north of Port Askaig is the Caol Ila Distillery, established in 1846. Another minor road heads north from a point not far inland from Port Askaig for the 3½ miles to Bunnahabhain Distillery, remarkably remote and enjoying stunning views across to the Paps of Jura. A few miles inland from Loch Askaig a very minor road turns off the main A846 and leads north to Loch Finlaggan and the excellent nearby visitor centre run by the Finlaggan Trust. On a pair of islands in the loch, one natural the other artificial, once stood the main residence of the MacDonald Lords of the Isles.